In the Directive 2009/28/EC for Renewable Energy the European Commission specified the requirements for the member states that have to be implemented through the national action plans of the countries. The national renewable energy action plans were supposed to be submitted by 30 June 2010. The plans are expected to describe a detailed roadmap of how each Member State expects to reach its legally binding 2020 target for the share of renewable energy in its final energy consumption. Renewable Action Plans of EU-member countries are shown on the website of the European Commission. Non-EU CEE-countries try to set up their national renewable energy action plans as a preparation for the intended EU-accession with support of the Energy Community. Albania adopted its first National Renewable Energy Action Plan (NREAP) in January 2016. It confirmed the target of 38% of renewables in final energy consumption in 2020 (from 31% in 2009), initially adopted in 2009 (at least 29% in the energy sector, 3% in transport and 10% in heating and cooling). State Programme for Building Energy Sources Powered by Local Fuels in 2010-2015 (adopted in July 19, 2010 by the Council of Ministers in its resolution No.1076). This resolution supports about 161 measures directed to effective use of local fuel resources, including wood fuel, secondary thermal energy resources and other renewable energy options. The document provides for the commissioning of the energy sources powered by local fuels and having a total electric and heat capacity of 23,55 MW and 769,68 MW, respectively. The imported fuel/energy resources substitution will amount to over 344,9 thousand tonnes of coal equivalent. National Programme of the Development of Local and Renewable Energy Sources in 2011-2015 (adopted in May 10, 2011 by the Council of Ministers in its resolution No.586). This document suggests measures for the replacement of imported fossil fuel through increasing the local fossil fuel extraction and introducing biomass-fired facilities, biogas plants, hydropower plants, wind-driven power-plants, thermal pumps, solar PV and solar collectors. For example, the programme envisages construction of hydro power plants with total installed capacity not less than 120 MW, wind power plants with total electrical capacity of 168 MW, introduction of thermal pumps to use low-grade secondary energy resources and geothermal energy with the capacity of 6,4 MW and introduction of 170 solar power plants and other equipment. "Renewable Market Watch" expects that the share of domestic energy resources including RES in the energy balance for the production of heat and electricity might reach 28 % in 2015, and 32 % in 2020. A National Renewable Energy Action Plan (NREAP) was adopted in April 2016, however, both entities have adopted their own renewable energy laws (as of 2013), feed-in tariff systems and NREAPs (in 2014). In the Federation BiH, a federal law on renewable energy sources and efficient CHP was adopted in 2013. It sets a regulatory framework to promote high-efficiency CHP and renewable generation; the entity’s NREAP targets 41 % of renewables and CHP in power generation by 2020, from 36 % in 2009. In the RS, a new Renewable Energy Law was adopted in 2013, followed by a NREAP in 2014. The NREAP sets a 48 % target for renewables and high efficiency CHP in power generation by 2020, from 42 % in 2009. In 2018 November, the Federation BiH updated its Renewable Action Plan. The action plan sets tentative targets for the share of renewable energy in the total final consumption in the heating and cooling, electricity and transportation sectors for 2020. According to the action plan, by 2020, the share of renewable energy should reach 44% in the electricity sector, 49% in the heating and cooling sector, and 10% in the transportation sector. Bulgaria has set a target of 16% share of renewables in final energy consumption by 2020 (21% share in electricity consumption, 24% share in heating and cooling, and 10% share in transport) in line with the European Directive on the promotion of renewable energy. 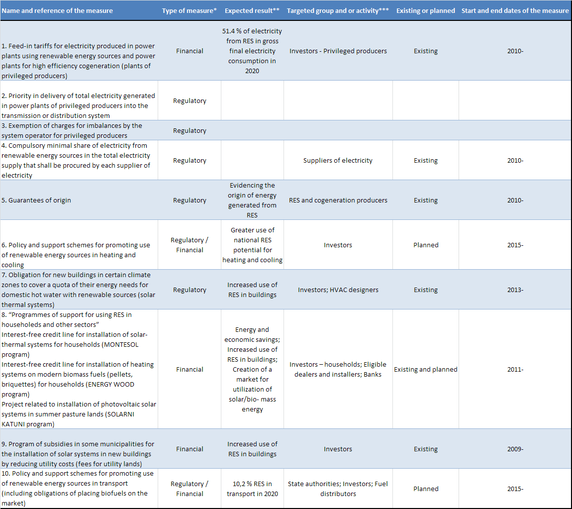 The January 2013 National Action Plan for Renewables (NREAP) confirmed this target and set out 58 measures to encourage renewables development. The 16% target for RES was achieved in 2012 and no further steps have been taken to increase the share of RES in the country. In October 2013, Croatia adopted the National Renewable Energy Action Plan (NREAP), committing itself to include 20 % of renewables in final energy consumption by 2020. The target also includes 39 % share of renewable energy sources in the electricity production, 10 % share in transportation and 19.6 % share in heating and cooling. With a 45 % share of renewables in electricity production as of 2015, Croatia by far exceeds its 2020 target. The share of renewables in final energy consumption stood at 29 % and at nearly 40 % in the heating and cooling sector as of 2015, respectively, thus also exceeding the 2020 targets. Only in the transport sector stood the share at 3.5 % as of 2015, with the goal being 10 % in 2020. The Biofuels National Action Plan is therefore in place to further promote the use of biofuels in the transport sector to reach the 2020 target. The 2010 National Renewable Energy Action Plan, which was resubmitted in 2013, lays out plans to reach 15.3% of renewables in final energy consumption by 2020. An additional target for 10% in transport is also set out. There is no mandatory quota for electricity from RES in the Czech Republic. The National overall target for the share of renewable energy in gross final consumption is set to 25%. The Directive on the promotion of energy from renewable sources sets a target of 25% renewables in final consumption by 2020, 2,7% of which should be covered by transport, 4,8% by electricity and 17,6% by heating and cooling. According to the Development plan of the Estonian Electricity Sector until 2018 the target for the share of renewables is 15% by 2020. The same target value applies for the share of CHP in gross electricity consumption by 2020. The roadmap to reach Estonia’s renewable energy goal of 25% renewable energy in total energy consumption is laid down in its Renewable Energy Action Plan 2020 published by the Ministry of Economic Affairs and Communications . Hungary's national renewable energy utilisation action plan was published in December 2010 and sets a target for energy from renewable sources in gross final consumption by 2020 at 14,7%. Renewables should account for 10% of transport consumption, 10,9% of electricity consumption and 18,9 % of heating and cooling, all by 2020. Details for Hungary's Renewable Energy Utilisation Action Plan are published on the website of the Ministry of National Development. Hungary developped support schemes for the promotion of renewable energy sources in the fields of electricity, small power plants, heating and cooling and transport. In 2010 Lithuania, under its National Renewable Energy Action Plan, adopted a target of 23% for the share of renewables in final energy consumption by 2020, in line with the target set by the European Directive. Renewables are expected to account for 10% of the transport sector's energy consumption, 39% of energy consumption for heating and 21% of electricity generation. The RES target was reached in 2014 and exceeded in 2016 with nearly 26% mainly due to a greater penetration of renewables for heating (3.6% for transport, 46.5% for heating and nearly 17% for power generation). The National Energy Independence Strategy was approved in November 2017, which sets a target of 30% of renewables in final energy consumption by 2020, to be raised to 45% by 2030. Wind capacity should be raised by 50% between 2017 and 2020 – solar capacity should double – to increase the renewable capacity 2.5-fold by 2030. By 2050, renewables should cover 80% of the electricity. Wind power should account for at least 55% of renewable power generation in 2030 and 65% in 2050. To encourage the development of renewables, Lithuania aims to have over 500 000 “prosumers” by 2030. The NEIS expects renewables to cover at least 60% of district heating energy consumption by 2020. The implementation of a green certificate scheme has been postponed from 2013 to 2021. Renewable power producers can apply for subsidies and soft loans (up to €200 000 and up to 80% of the project cost) under the Lithuanian Environmental Investment Fund support mechanism. The first National Renewable Energy Action Plan (NREAP) was approved by the Government in 2013. It was adopted and submitted to the Energy Community Secretariat according to Directive 2009/28EC, followed by a second report in february 2017, showing grood progress in reaching its goal, except for the transport sector. 27% of RES in heat and cooling. The National Renewable Energy Action Plan of the Republic of Moldova for 2013-2020 can be downloaded here. The National Renewable Energy Action Plan (NREAP) for Montenegro was published on 29 December 2014. Publication had been expected by June 2013. The NREAP had to be prepared in accordance with the template published by the European Commission. It is the objective of the NREAP to reach the legally binding renewable energy target by 2020. In the NREAP the Contracting Party lays down the sectoral targets and determines the trajectory to follow in the years to come. The NREAP has to comprise detailed descriptions of the measures and reforms the Party intends to undertake in order to overcome the barriers when reaching the targets for renewable energy. Greater use of renewable energy sources is one of the main strategic goals in the energy sector for the Government. This is very important for the energy security of the country, the supply of clean energy, but also to create the conditions for sustainable energy development in the country and the region. North Macedonia follows the legislation adopted by the European Commission in the field of renewable energy sources, taking into account the new Directive 2009/28 / EC of the European Parliament and of the Council of 23 April 2009 to promote the use of energy from renewable sources. North Macedonia adopted its National Renewable Action Plan (NREAP) in November 2015, setting the renewable energy target share in final energy consumption at 21 % by 2020 (up from 17.4 % in 2009). Out of this, the share of renewables in electricity is seen at 25.6 % (up from 16.7 % in 2009), 24.6 % in the residential sector (28.9 % in 2009) and finally, 10 % in the transport sector (up from 0.4 % in 2009). North Macedonia plans to increase its renewables capacites to around 800 MW or 2060 GWh by 2020. Nearly all of this new capacity (709 MW or 1835 GWh) is seen coming from hydropower plants with over 10MW installed capacity. Poland intends to reach a 15% share of renewable energy in its final consumption by 2020 thus following the EU Directive on the promotion of renewable energy. Poland aims to double power generation from highly efficient cogeneration (CHP) between 2006 and 2020. The National Fund for Environmental Protection and Water Management (NFOSiGW) has allocated PLN 800m (€183m) over 2014-2020 to support renewable installations in residential buildings for their own consumption. The Act on Wind Farms also came into force on 15 July 2016, restricting the location of wind parks (on the basis of a local master plan, minimum distance between wind turbines and habitation set at 10-times the turbine’s height), strengthening permit requirements and raising taxes on wind turbines. In December 2016, Poland was the first country to issue €750m worth of five-year "green bonds" (yield of 0.634%). Polands renewables production in 2015 was 8,99 Mtoe, which accounts for 12,64% of the total primary production. Poland has an installed capacity of 2,37 GW hydro power, 4,89 GW wind power and 0,11 GW Solar PV and the gross electricity generation of renewables are 23,29 TWh in 2015. Poland has set a target of 10% for biofuels in transport by 2020. The mandatory share of biofuels in blends was raised to 7,1% in 2013 to 2016; it will be raised to 7,8% in 2017, 8,5% in 2018 and 10% in 2020. Romania's National Renewable Energy Action Plan (NREAP) was adopted in 2010 and sets targets for renewable energies by 2020 (24% in final energy consumption, 22% in heating and cooling consumption, 10% in transport and 43% in power production). Romania already met its 2020 RES target by achieving 24.8% of renewables in final energy consumption in 2015 (see EUROSTAT). The NREAP will be updated in the next reporting period to reflect the scenarios detailed in the Romanian Energy Strategy (2016-2030). The Serbian National Action Plan for Renewable Energy (NREAP) published in 2013 plans for the share of renewables in final energy consumption to increase from 21 % in 2009 to 27 % by 2020. Out of this, the share of renewables in electricity by 2020 should climb to around 37 % (28.7 % in 2009), 30 % in the residential sector (25.6 in 2009) and 10 % in the transport sector (0% in 2009). Serbia also plans to add around 1092 MW or 3653 GWh (of which 500 MW wind) of new renewable generation capacities by 2020. Total investment costs for this are seen at around € 2.3 billion. The National Renewable Energy Action Plan of Slovakia (2010) states that by 2020, the Slovak Republic aims to achieve 24% renewable energies in the electricity sector and 14.6% in the heating & cooling sector. In addition to the overall RES goal of 14% by 2020, the Slovak Republic is also obliged to meet the 10% renewables target in transport also set forth by the RES-Directive. In line with the European Directive on the promotion of renewable energy sources, the national target is to raise the share of renewables in final consumption to 25 % in 2020. Renewables are expected to account for 10.5% of the energy consumption of the transort sector, 31 % of the consumption of the heating sector, and more than 39 % of the consumption of the electricity sector. Price regulations (feed-in tariffs and premiums) as well as renewable certificates are used to promote renewable electricity and cogeneration of heat and electricity. With the support of the EBRD, the Turkish Ministry of Energy and Natural Resources developed Turkey’s first National Renewable Energy Action Plan in line with the EU’s Renewable Energy Directive. In this plan, Turkey aims to develop 30% of its total installed capacity from renewable sources by 2023. 10% of the energy needs of the transport sector should also be met by renewable energy. In 2014 the National Renewable Energy Action Plan (NREAP) was accepted, responsibilities lie also within the SAEE. As renewable energy is a good way of raising security of supply, Ukraine aims to raise the share of renewable energies in final energy consumption up to 11% with hydropower up to 15% by 2026. Furthermore bioethanol and biodiesel production should also be increased by 2020 up to 0.32 and 0.07 Mtoe. The biofuel share should achieve 7% of total fuel consumption. To support this goals the State´s monopole on ethanol production was determined in 2015. This page offers information and latest news on energy in central and eastern Europe. The information is prepared in the frame of a project financed by the Federal Ministry of Sustainability and Tourism. 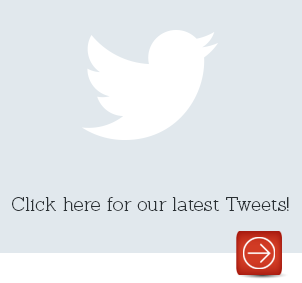 Click here to provide feedback!